Zion Market Research has published a new report titled “Environmental Health and Safety Market by Component (Solution and Services), by Application (Wastewater Management, Medical & Pharmaceutical Waste Management, and Industrial Waste Management), and by End-User (Energy and Utilities, Healthcare, Chemicals and Materials, Construction and Engineering, Government and Defense, Food and Beverage, and Others): Global Industry Perspective, Comprehensive Analysis, and Forecast, 2017—2024”. According to the report, the global environmental health and safety market was valued at USD 4.35 billion in 2017 and is expected to reach approximately USD 9.63 billion by 2024, growing at a CAGR of around 12.4% between 2018 and 2024. Environmental health and safety is a process that implements practical features of environmental protection along with safety at work. The regulatory requirements play a key role in the EHS process, where the EHS department managers identify regulations and implications that must be conveyed to the executive management. The result this process involves the company implementing necessary suitable actions. The environmental health and safety solutions make it easy for organizations to maintain, track and manage manufacturing and use of chemical activities. While keeping a track of such activities, more focus is given to chemicals that can harm the environment and living organisms, like mercury. The global environmental health and safety market is majorly driven by the increasing number of accidents in various industries, such as energy, mining, chemical industries, and construction. Additionally, the need to adhere to legal requirements to comply with the EHS standards across the world is another major factor that is likely to contribute toward the environmental health and safety market. However, the high installation cost of environmental compliance software and lower adoption of EHS tools by small businesses might hamper this market. Nonetheless, emerging economies have accepted the international standards that are likely to create more market opportunities. By component, the environmental health and safety market is bifurcated into solutions and services. The service segment is likely to register the highest growth rate over the forecast time period, owing to the increase in the demand for analytical services that allow enterprises in aggregating data from a number of resources and help in analyzing to increase profit. Wastewater management, medical and pharmaceutical waste management, and industrial waste management form the application segment of the environmental health and safety market. The industrial waste management segment is expected to grow at the highest growth rate over the predicted years, owing to the increase in the compliance requirements in various industries, such as chemicals and materials, manufacturing, construction, and engineering, etc. By end-user, this market includes energy and utilities, chemicals and materials, healthcare, construction and engineering, government and defense, food and beverages, and others. The energy and utility sector is projected to hold the largest market share over the forecast time period, due to the increased adoption of environmental health and safety solutions. North America dominated the global environmental health and safety market in 2017, due to the strong established economies of the U.S. and Canada. These countries invest heavily in R&D activities, resulting in the development of advanced technologies. The U.S. was the largest contributor to this regional market and will continue to dominate the market over the projected years as well. Europe is estimated to witness significant growth over the forecast time period, owing to the adoption of EHS solutions in the varied industrial applications. Asia Pacific is estimated to register the highest growth rate in the projected years, owing to the investments made in the R&D of environmental health and safety solutions and services by governments of various countries in this region. 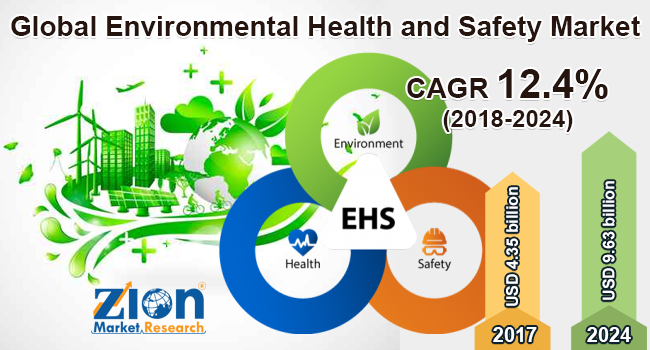 Some of the key players operating in the global environmental health and safety market are SAP, Enablon, Intelex, ETQ, Gensuite, Enviance, Cority, Verisk 3E, Optial, Velocityehs, Sphera Solutions, and Sitehawk, among others.